There are several tools on offer to assist your shopping experience, we have highlighted 6 of them for your reference. Customize your search via our 'My Categories' function to bookmark your favorite categories. Add to your 'My Category' list, simply click on the 'Track Categories' button directly above the displayed items, near the top of the page in the category page you wish to bookmark. To view bookmark categories click 'My Categories' at the top of the page. If you did not see your new bookmark, please press F5 to refresh the page. Each bookmark includes a delete option [X], the shopping mall icon, category labels and category name. There are 3 types of bookmark labels depending upon the condition of where the page was bookmarked. These label classifications include: by search, by classification (via navigation) and by seller ID. These bookmarks will remain there after signing out. If some of your bookmarks become redundant, there is a delete option to remove them. You can search using your preferred keyword search terms, such as brand name, to view a category page that includes a range of useful keyword search terms. You can also bookmark this page into 'My Categories' listing by clicking on the 'Track Keyword' button. Thus, you can search across all the associated keyword terms when you next sign up or refreshing the page. When you find a store you are interested in and you particularly like the Seller, click the "Add Seller to My Category" button at the right side of the item page. You will be able to view all the seller's items when you next sign up under your 'My Category' list. You can also sort your items in your watch list using the 'Add Note' function. This will enable you to prioritize your watch list more efficiently. 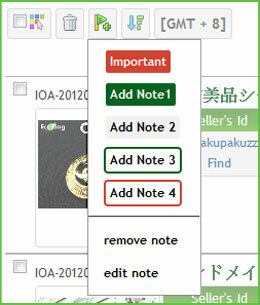 Simply select an item (clicking the checkbox), click 'Add Note', select one of the add note labels and enter your note. You will see your note within the title summary description area. Within each item page you will find several translation tools powered by Google Translate (located left side of the item title and above the item description) to help you understand each item information. Furthermore, some crucial information will be highlighted in yellow for easier readability and knowledge on the item, even if it is sometimes in Japanese ready for translation. You may find highlighted notices, in yellow, inside the Japanese original item page, embedded inside Mogan's item page. These notices are to help you be more aware of certain conditions associated with the item. Such notices could include shipping and delivery, new or 2nd hand, disfunctional (antiques), shop demos. Why did I not win the bid even though I was the highest bidder? There are a few reasons where this rare condition may occur. The seller prefers not to deal with deputy service representatives. The seller does not wish to have their items sent internationally. The seller does not sell items to buyers whose account have a few negative feedback. The seller has some specific requirements such as, to ask before placing a bid, etc. Mogan Shopping operates as a deputy service on your behalf, providing a smooth and enjoyable international shopping experience. However on occasions, some rare conditions occur that are out of our control to prevent or avoid. In such a case like this, we would suggest you to remove this order and receive your full and deserved refund. Thank you for your understanding, patience and cooperation.